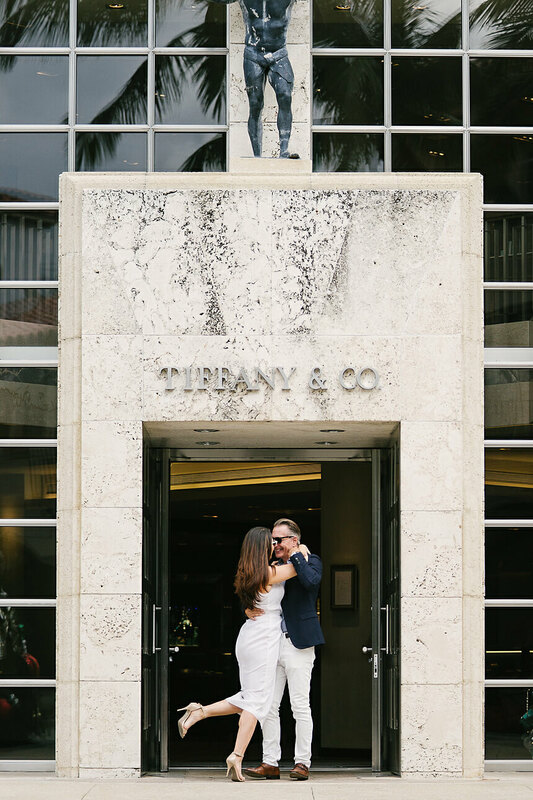 Samantha and William’s Worth Ave Engagement Session was one of my favorite sessions as Miami Engagement Photographer. 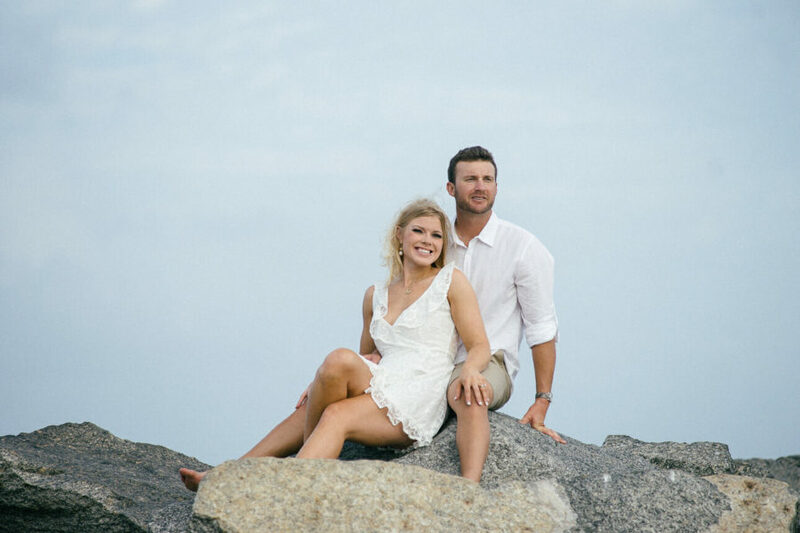 I will shoot the wedding at the Breakers in Palm Beach for this lovely couple in just 3 months. Part of my wedding photography package is also engagement session. In the first moment, Samantha was not sure, if she even wants it, but after I explained her my ideas we decided to do it. And now we all are happy! I asked Samantha what are their favorite spots or activities. 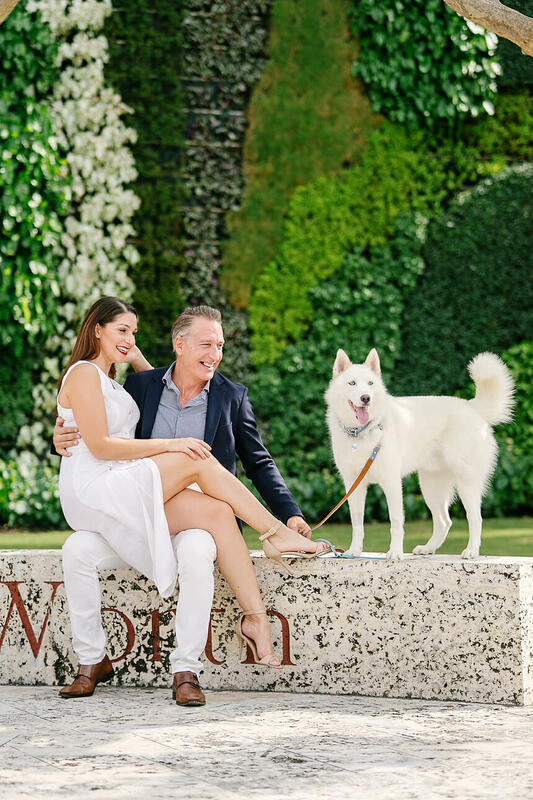 After a short chat, we’ve agreed that we will do their engagement session in Palm Beach at one of my favorite streets, Wort Ave. We were able to set this session for Sunday morning in December. December is usually very nice in South Florida and as expected we have had a really beautiful day. Some clouds but mostly sunny and warm. We started on the west side and slowly walked to the ocean. I love Wort Avenue because it has so many hidden and beautiful places. As we were walking east, I wanted to do few pictures by the green wall. And as usually I spotted stranger dog. But this one was a fancy one. Beautiful white dog. His owner agreed and we were able to use him for few minutes. It was so precious. I hope you like these pictures. Let us know in comments below. And if you want to see more of our engagement sessions, you can do so in our engagement archives. And I love how you was able to use the dog. You know me how I love including dogs to my pics! 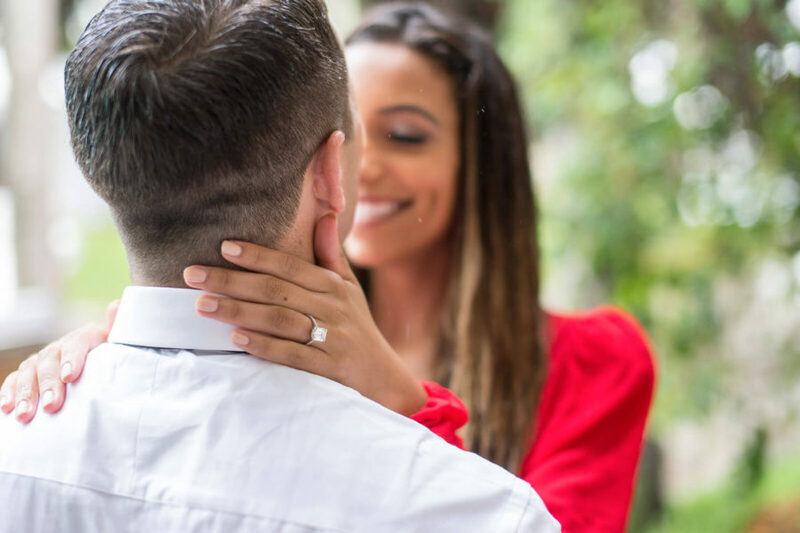 This is a gorgeous worth ave engagement session! I love their outfit choices, and that you added their dog into the shots! What a stylish couple! Love how you’ve managed to tell their story through these great photos. Perfect choice of locations too! What a beautiful couple in a romantic location! Congrats to them for their engagement and great job at this session! What a stunning couple! And those locations were just perfect, it seemed to fit their personalities well! Great job on the shoot, love your editing too. Hi Hilary, Thank You very much! These are absolutely stunning! I love this location and it’s so awesome athat this was one of their favorite spots. These were classic and beautiful. Amazing work! What a gorgeous couple – they are so cute together. I love how you’ve captured them. Stunning photos! I love your use of natural lighting. What beautiful pictures of a beautiful couple! I love that the dog was included. Beautyful couple, romantic locations nd that dog,,, everything is best. I love it when photographers are good at what they do and above all when the couples are stylish. These two combinations makes an undeniably great result. Thumbs up. I love it when photographers are good at what they do and when the couples are stylish. These combinations produces an undeniable fantastic result. Thumbs up. Thank You for stopping by and nice comment! It’s incredible how you were able to capture all those moments. Every photo can tell it’s own story. These are some outstanding pictures. I love that you included the dog in their photos. Beautiful locations. thank You very much for nice comment! What beautiful shots, and you’re now giving me serious ideas about couple shoots like this. Wonderful! thank You, I’m happy then! Thank You very much, Swati! Love is in the air..i love everything about the Photoshop. Superb pictures. These pics are so beautiful. I always enjoy your posts and pics. Thanks for sharing. What an utterly stunning couple! I love how you used the locations and the light. And, oh hey! Puppy! Gotta love the puppy! Yes, gotta love the puppy! Thanks a lot for dropping by. Nice poses. I like how the dog got in on it too! Great photos. Yes, the dog had its share of the spotlight. Thanks a lot Cindy. Jan, as always, gorgeous work!! So classy, yet fun. I love the restaurant scenes and that garden wall is just gorgeous. Miami is blessed to have you! Wow, thank you so much for your kind words Sarah. Love this classy engagement shoot! The couple is so happy and in love and you captured them perfectly! What can I say, great couple plus plus great venue at Worth Ave equals perfect engagement session. Thanks Daisy. Lovely couple and stunning locations! Love that you utilized so many locations during their sessions. Gorgeous couple, I love their style!! As always, you nailed this engagement session!! Beautiful work!! Indeed! I had a fantastic time at this engagement session at Worth Avenue with the gorgeous couple. There seem so loved up 😃 you managed to use your lighting really well in all locations which I thought was really great, and it made for an interesting gallery that you did utilise so many different locations too. Thank you so much for taking time to check out my gallery. Have a nice day Chanelle. Thanks for sharing such a nice milestone of both your journeys, congrats again. Beautiful photos – glad to see another Sony photographer! I use a sony mirrorless as my travel camera and love it. Hey, that’s great! Thanks a lot for your kind words. The pictures are lovely and I love the idea of blogging alongside photography! My sister also does similar photography in India. Am sure your sister is an amazing photographer Sakshi. Thanks a lot for dropping by. These are STUNNING!!! Great use of lighting and scenery!! I appreciate that. Thanks for dropping by. You captured moments and it speak thousands words…… Classic work….. The Breakers is a beautiful choice for any venue, such love pictures! Indeed it is, thank you so much. What a beautiful couple! I love how much personality they seem to have in these photos. You did a fantastic job. This is great shots. 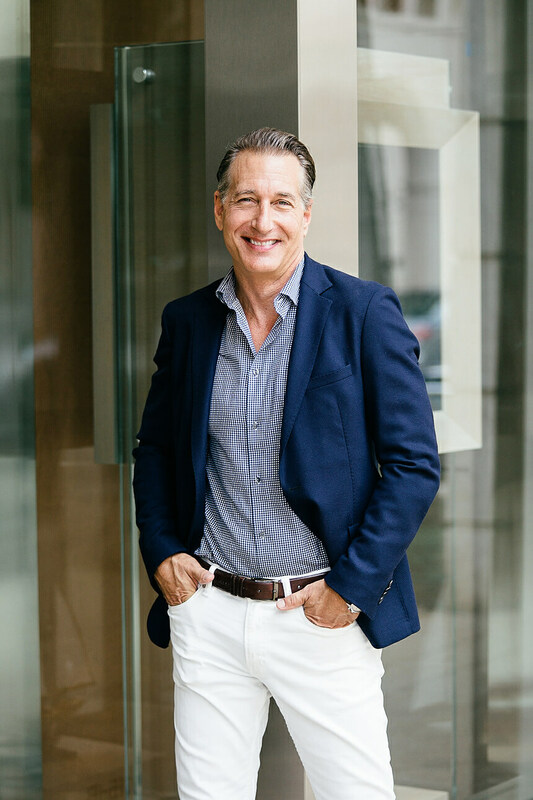 You brings out the natural and comfortable looks with your clients. Thanks for ideas! Thank you and you are most welcome. Thank you! Thanks for dropping by. Lovely photographs. Especially liked the ones with green in the background. Bring out the enhanced colours well! We also have a Sony camera but have not explored it fully as yet! Coming from someone who also takes fantastic travel photographs, thanks a lot for dropping by. These shots are just beautiful! The backdrop, the chemistry with the couple shines through with this shots. The chemistry and backdrop really adds up to the beautiful shots, I would say. Thanks. Every time we read one of your blogs and see the pictures… We want to get married again! Thank you so much, that’s definitely the sweetest compliment I have ever received. How lovely you guys are! I really like your true love story and hopefully you two will remain that relationship to the rest of your life! Thanks for sharing! Thank you so much Nathan. Have a nice day. These photos are absolutely amazing! I really like how the subjects interacted so naturally and I especially loved the dog!!! These are nnniiiccceeeeeee! I love everything about them….from the light to the detail of Sam and William! Thank you so much for your kind words and thanks for dropping by too. What a lovely couple! They look so elegant and stylish. And! most importantly, in love. They are in love alright! Thanks for dropping by Valerie. These photos are really beautiful. I think after seeing this, I would have had the same feedback as her. I love how the everything interacted and blended with each other. And that dog was sooooo cute.. 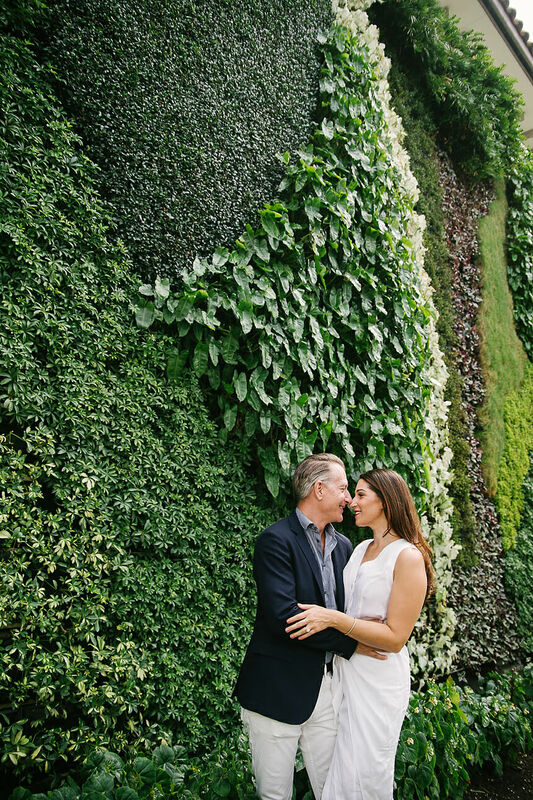 This engagement session at Worth Avenue was indeed fabulous. Thanks for your lovely comment Grace.